2 WORLD TITLES ALSO IN 2017! "CORSARO WIRELESS SYSTEMS KEEP RULING!" 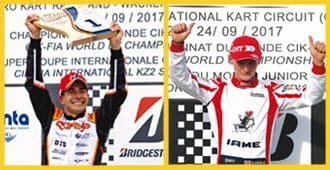 After two 2016 World titles, in 2017 CORSARO also wins 2 NEW TITLES in Karting with two different teams (CRG FACTORY, ZANARDI-CHIESA CORSE). The product refinements and evolution over the last two seasons have led to the best product in technical simplicity thanks to the complete absence of cables from the steering wheel to the engine and to the new WID-D modules and steering wheel batteries that allow the total autonomy to cover all the days of a world event without requiring recharges. The drivers: Paolo de Conto (World Champion KZ) and Danny Keirle (World Champion OK), as well as their respective teams, are most congratulated for the achievements and valuable suggestions to the continuous improvement of CORSARO line.